If it took place, it would be a great fight between two great fighters who are now in the twilight of their legendary careers: Juan Manuel Marquez against Miguel Cotto. And, in a piece over on ESPN.com, Dan Rafael has reported how Marquez, inactive since his May 2014 points win over Mike Alvarado, is in talks to face Cotto later this year. Understandably, considering his layoff, the Mexican great is not 100-percent sure he will actually fight again, much less against Cotto. But the 42-year-old future Hall of Famer has begun training again. A tune-up for Marquez would not be a bad idea, yet the fans would really look forward to a showdown between “Dinamita” and fellow multi-weight ruler Cotto. Marquez spoke about the ongoing talks. Why not indeed? 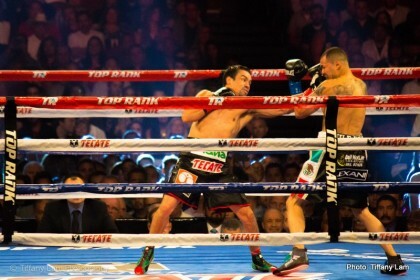 A Cotto-Marquez clash, in, say, Las Vegas, would almost certainly prove a big hit with the fans. Cotto is coming off that fine display against the much bigger and younger Canelo Alvarez, and against a man closer to his own age (in fact Marquez is seven years the older man) and smaller than he is, the fight would almost certainly appeal to the Puerto Rican star. The weight the fight would be contested at is one of the talking points. Rafael reports how the fight could take place at welterweight or at a catch-weight of 150-pounds, and that Marquez must negotiate with Cotto’s promoter, Roc Nation. Two fine ex-champions looking at cementing their legacy with further big and important wins, one of which could come over the other, who wouldn’t want to see this fight? Cotto, 40-5(33) showed in the fight with Canelo he has plenty left, whereas in his own last fight (admittedly almost two years ago) Marquez, 56-7-1(40) showed he too is far from finished. Next boxing news: Tyson Fury’s latest Tweet sure to cause speculation: Fury says we will never guess who his next fight will be against!